Apart from applying nail polish on your nails, did you know that this beauty accessory can be used for many other useful purposes? Read on to find out more! 1. If you have a pair of heels that you're bored of, instead of stacking them away, upgrade them by painting their soles with nail polish. Coloured opaque paints work best, since they won't reveal the true colour of your shoe. While doing this, you don't want to get the nail polish on the other parts of your shoe. So use masking tape along the edge where the shoe meets the sole—the same way you would protect the ceiling and window panes when you're painting a room. Once you've painted the sole in your desired colour, allow it to dry before applying a second coat (if needed). Finally, pull off the tape to reveal a neat polish job. 2. Did you know that you can cover up a scratch on scuffed shoes or boots, with nail polish? If you have coloured shoes, and if you are not getting the same coloured shoe polish, just use a nail paint that matches the shoe colour! Remember to put the shade on your nail first, give it a minute to dry off and then check the colour, as a test. If you think the shade matches your shoes, feel free to apply it on the scratch marks. 3. 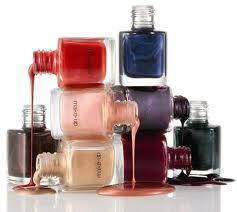 Add some funk to your favourite accessory - say a bag or clutch, by using nail polish. How? It's simple. Take some stencils and tape, and paint your initials on the bag! 4. You can change the look of any junk jewellery piece that you have. Take a ring, pendant or earrings and colour them with pops of bright colours like neon green or hot pink. Simply lay the jewellery piece flat on a paper towel and begin to paint. 5. To prevent new, imitation jewellery from tarnishing, paint it with transparent or clear nail polish. When air hits the metal, it oxidizes it and changes its colour. Since the clear nail polish locks out air, it will help keep your costume jewellery looking nice and new.